For Molly Durbin, 23, becoming an Associate to the Sisters of St. Joseph felt like where she belonged. As a business major at Fairmont State University in Fairmont, WV, Molly rotated between attending Mass at the campus Newman Center and at Immaculate Conception parish, typically choosing the location where Father Walter Jagela was presiding over Mass. When Molly began contemplating religious life during her sophomore year, Father Walt helped her explore possibilities. “Father Walt related very well to college students. He became my spiritual director and we went to convents together and he nudged Sister Stella and told her that I was considering religious life,” Molly says. 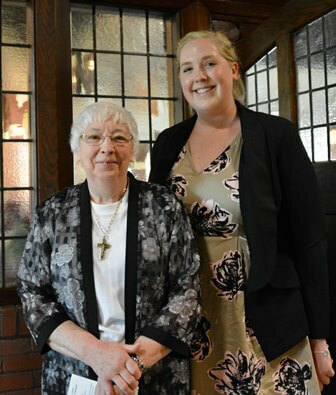 Sister Stella Cronauer, pastoral associate at the parish, reached out to Molly and was struck by her engaging spirit and enthusiasm and her social justice advocacy. They talked about vowed religious life and Sister Stella also mentioned the Associate program as another way to share in the mission and life of the Sisters. Molly tucked this option into the back of her mind as she continued to visit convents. Many of the Sisters she visited spoke about feeling a distinct “pull” to religious life, but Molly wasn’t sure if it was right for her. 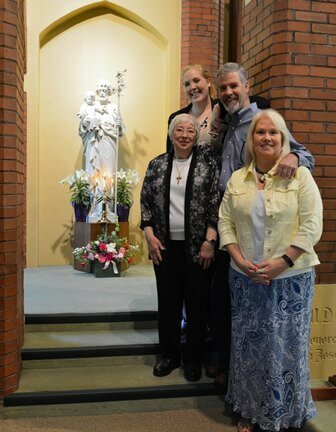 Molly began attending monthly prayer gatherings that included the CSJA orientation program with Sister Stella and Associates Sue Boyce, Carolyn Boyers, Mary Rose Mustachio and Nancy Wood, all of whom are parishioners at Immaculate Conception. She was especially appreciative that the group changed their regular meeting night from Monday to Sunday to accommodate her class schedule. “The Chapel is beautiful! There was oneness of spirit in the music. It was prayer. The homily was inspirational,” Molly’s mother, Pamela Durbin, wrote on the Sisters’ Facebook page after the celebration. As a child, Molly went to public school and attended evening catechism classes. In high school, she was bullied and recalls coming home from school sobbing until her parents recommended considering a private school. She settled on Delone Catholic High School in eastern Pennsylvania and loved her principal, a Sister of St. Joseph from New York. With college graduation just a week away, Molly hopes to secure a position doing training and development and has already had several interviews. She’s also excited to dive into community involvement as a CSJA and is particularly interested in the Sisters’ environmental and pet therapy ministries. She also relates to the Sisters’ willingness to help anyone in need and strives to do the same in her own life. Interested in learning more about our Associate program?